Ah, humans. What wonderful and mysterious beings we are. Millennia of human history have shown us that the systems we create, especially our systems of politics, are inherently fragile and often extremely flawed. We are complex creatures who are predictably irrational in our behavior; we often build rules to protect us, from us. The pursuit of an optimal structure for governance has plagued every ‘tribe’ (society and organization) since human consciousness; and is still an unproven experiment (outcome TBD). Look no further than the fragility of our existing ‘democratic structures’ for evidence. Governance occurs both within and between the institutions and entities that make up a system. Despite popular belief — it is not a static and fixed process. It is largely dynamic and evolutionary; dependent on interactions of actors in systems. Governance for the sake of this conversation, is broadly defined as the set of processes that comprise how a state, market or system ‘makes rules’. The familiar mechanisms of governance include: laws; cultural and social norms; language. Historically speaking, these are administered via both soft and hard expressions of power through violence, coercion, collusion; and other more subtle mechanisms like social signaling and virtue signaling, appeals to authority, and the like. Sidebar: Much pontification has been done about the nature of on-chain and off-chain governance, as well as formal and informal governance mechanisms. Instead of providing a thorough review of this literature here, I will simply state that there are as many opinions as there are individuals expressing these. As you’ll likely agree, the optimal form of governance for each of us is that which serves our individual preferences and benefit, regardless of how deeply and ardently we justify and rationalize these arguments. I am frequently confronted with my own biases and rationalizations for these, and must confess, I often question my own incentives in engaging in these debates. It turns out that translating or iterating on these historical analogs in ‘blockchain land’ often leads to similar results. I by no means believe my thoughts are unique or authoritative, and the process of informing my thinking by using data — as shared in the graphics that follow — was a hard fought battle indeed. More on this at the end. So, let’s begin with the most basic question. Who Has The Right to Govern? For the purposes of this piece, I decided to focus on the five largest networks deploying on-chain governance today, since this would give us some empirical evidence, however imperfect. Here is a brief summary of these five networks, who has the right to govern each, and how participation varies based on these dynamics. One More Side bar (I promise): I want to be careful not to conflate Proof of Stake, which is a consensus mechanism for securing the network, with governance — which is the process of decision making about changes to the network and how to utilize resources dedicated to the network. 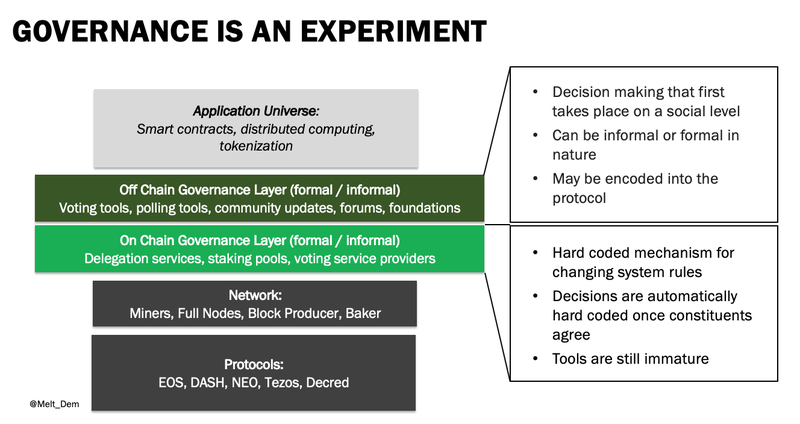 There is an emerging trend within protocols of using the same “Proof of Stake” tokens to vote, but there is a difference in function here, just using the same tokens (as opposed to systems like Aragon which have their own second, independent token dedicated to “voting.”) For the purposes of this post, I am talking about using tokens for governance, not security and sybil-resistance. Each network has its own, nuanced mechanism for governance and these slight nuances make “participating” in each network incredibly time consuming. 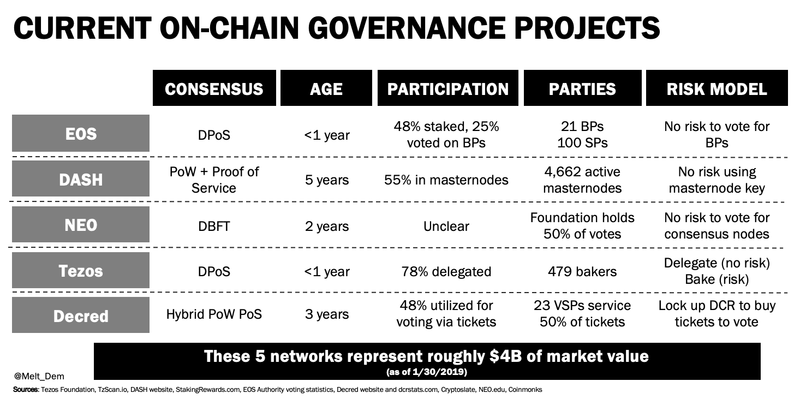 The risks associated with “participating” in governance in each of these networks is also vastly different, and therefore, any wise participant would carefully weigh the potential risk and reward of their participation in on-chain governance before proceeding. There are a number of additional risks that are difficult to capture succinctly, but it suffices to say, in *all* of these networks, active participation in governance is time consuming and requires a non-negligible investment of time and energy. 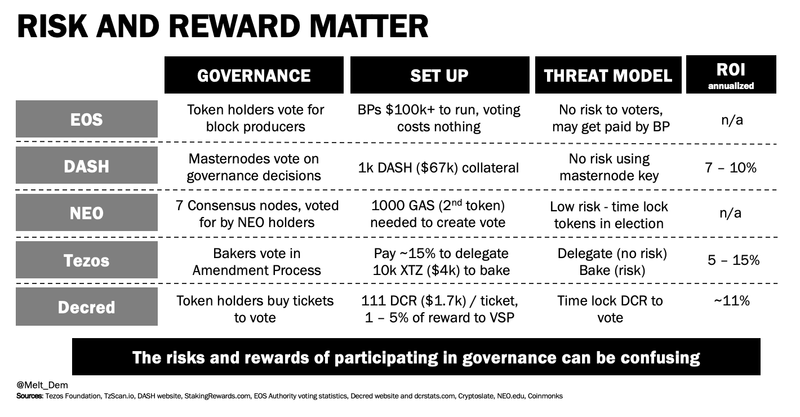 Looking at this very basic risk reward analysis, we can quickly start to determine where participation is profitable and where it is not, which might inform why we see certain networks gravitating toward more or less competitive dynamics in governance. Who Has the Will to Govern? Given that it’s so time consuming to follow all of these protocols, to know the main actors and main influencers, to track development updates, to track network evolution and growth, and to track the flow of money — it’s beginning to become clear that there are really two, perhaps three, key motivations for those who participate in governance. It’s no real surprise that money and power dominate the conversation when it comes to governance. People were outraged when I suggested as much in my thinking around Tezos, but as more proof of stake protocols emerge, I imagine we’ll start to see the beginnings of crusades and idealogical wars between the entities below. Collusion, coercion, manipulation, lobbying, bribing, and gerrymandering are part and parcel to the processes of modern democracies. It would be foolish to believe that crypto governance would be absent these forces, and many systems, while they may be technically robust, are susceptible to social engineering. We already see coercion and collusion for instance, in EOS, where there have been numerous accusations and in-depth investigations of collusion and cartel-like behavior amongst exchanges, investors, and the Block.one team. 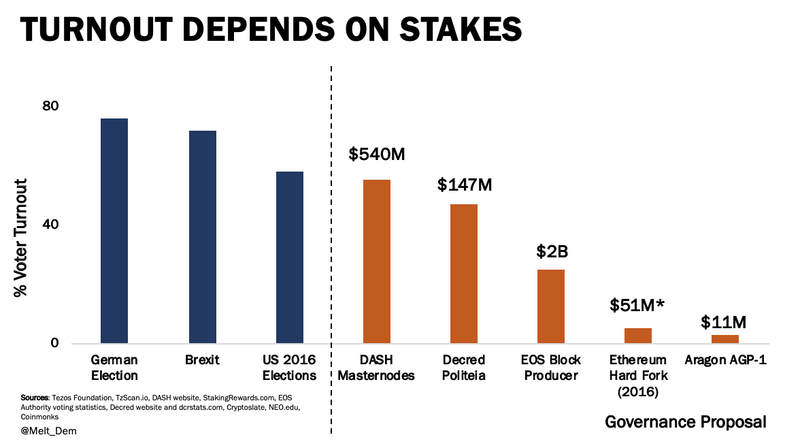 In fact, as I was writing this, the Cosmos team merged a change to remove a cartel with 53% of voting power from “Game of Stakes” — their testnet. Looking at the five protocols I analyzed, it’s easy to see the balance of power amongst network participants. Perhaps the best way to measure the ability for participants in a system to express their will is to look at the turnout rate for votes. As we can see, participation is each protocol is challenging to measure, and I fully agree (with you, the reader yelling at the screen) that the above is an imperfect measure. Ease of Voting: If voting is difficult, whether it be technically difficult ( e.g. needing specialized hardware or specialized technical competence) or physically difficult (e.g. needing to travel somewhere or have robust connectivity to a network) turnout is likely to be lower. 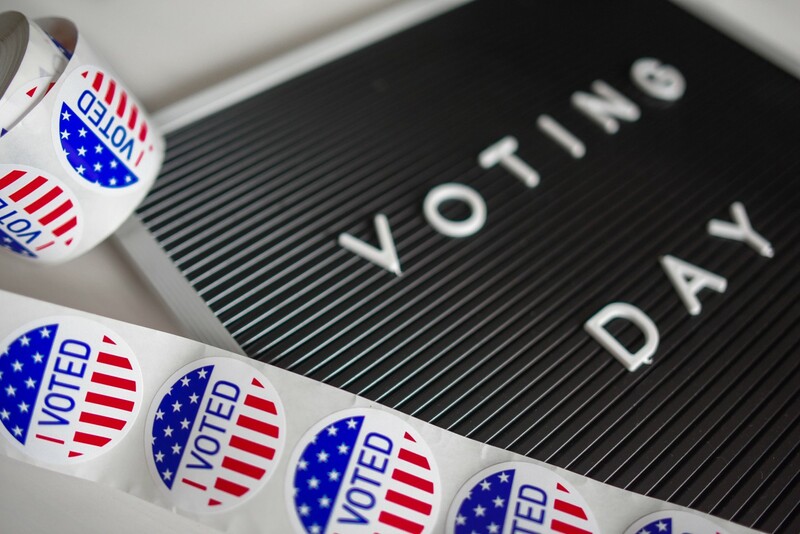 Today, most blockchain-based voting mechanisms feel clunky to users, and therefore casual users are unlikely to invest the time and energy to participate in voting if it requires using new software of paying for tickets, etc. This is why increasingly, funds with numerous token holdings are relying on staking-as-a-service providers to offer their specialized expertise, as these funds don’t have the time to manage the mechanics of five, let alone fifty protocols. Specialization will inherently emerge as these systems grow in complexity. Risk of Voting: If voting represents potential risks, either social (reputation damage or privacy loss); financial (capital loss); or physical (violence) then turnout is likely to be lower. In most current systems, voters are compensated for taking risk by putting their assets “on chain” or in escrow by getting a direct vote, while those who don’t get little say. However, one of the aspects that hasn’t been covered as widely is ‘reputational risk’ and privacy. For voting to be effective, privacy is tantamount. Should it be possible for participants to express unpopular opinions without feeling like they’ll be ostracized by the hordes on crypto twitter? I believe yes, but others (see below) may not share that sentiment. We’ll also cover this later under the topic of “ochlocracy” or rule by mob. Personal Gain: The most important factor of all is how much someone stands to gain by participating in governance via voting. In my view, what on-chain governance has done most effectively is put a price on network participation. This is a rather contrarian view, but I believe networks that provide a financial reward for ‘politicking’ will become over-run with the types of people attracted to these schemes. As someone who spends most of her time in bitcoin, where there isn’t a direct link between participation and compensation, and everyone is a volunteer, I wonder if we lose some of the magic of “community” when we ‘financial-ize’ participation. The stakes in these games of governance will only continue to grow. The below graph represents the financial incentives at play in each of these protocols. The financial incentives will only grow as the value of these networks grow, and as the stakes continue to increase, I expect increasingly sophisticated players to enter the market for governance. We also can’t ignore the unquantifiable “path dependency” stakes in these protocols, which we saw play out in bitcoin’s political landscape over the last three years. Many people building businesses on top of these networks are dependent on certain changes being implemented. Make no mistake, the ability to influence and control the future development of the network — what changes get merged, how governance itself evolves — in the right hands, can be priceless. So where does this leave us? While I’d love to imagine a world where governance is perfectly competitive and many service providers emerge to offer users practical tools, I believe the current state of on-chain governance is trending more towards oligopolies. Each protocol has its own ruling party and its own oligarchs, some better known than others, and these parties will collaborate to maximize outcomes in their own favor. Mind you, those outcomes might also happen to be optimal for all network participants; negative externalities do not have to manifest as a result. I do believe certain exchanges, investors and individuals will align themselves with specific protocols where they can “govern” or exert control more effectively; and play a more active role in shaping the future. We already see this already, in the form of services like Staked and Battlestar Capital*, which support crypto funds by “compounding” their crypto and taking advantage of the opportunity to earn financial returns via staking. It’s odd to me that the politics of staking-as-a-service providers haven’t been discussed, but it doesn’t take a leap of the imagination to see that large service providers could effectively become “cartels-in-a-box” for large investors. You may balk at the use of the word ‘cartel,’ as it brings to mind images of drug kingpins and oil-rich kleptocracies…calm your imagination… cartels have a rich history in emerging markets, particularly in new industries, where economics dictate that collusion is more profitable than no collusion, and consumers have few alternatives. While to date, the incentives of investors (speculators) and networks have been largely aligned, I would not expect that to be the case in the future. I know I keep belaboring the point, but remember that speculators, i.e. investors with fiduciary obligations, are *not* users. Therefore, I’m extremely wary of projects where speculative investors control more than 50% of the tokens, and therefore, 50% of the votes. Some investors may convince you they are there to do what is best for the protocol, and I do believe that many investors provide positive contributions to the crypto community. Of course, I am myself an investor, and therefore fall into this same camp. I have no illusions about the conflicts of interest here. The “cartel of good intentions” (see this Foreign Policy article which helpfully introduces and defines the phrase) ultimately is all about charting a course which maximizes profit. While we may all have the best of intentions, ultimately, tools are neither inherently good or bad, just or unjust. It is in their use, by humans, that these tools can take on this character. The phrase “absolute power corrupts absolutely” is perhaps a fitting reminder of what happens when we couple power with politics in protocols. Perhaps borrowing from history would be most appropriate here. 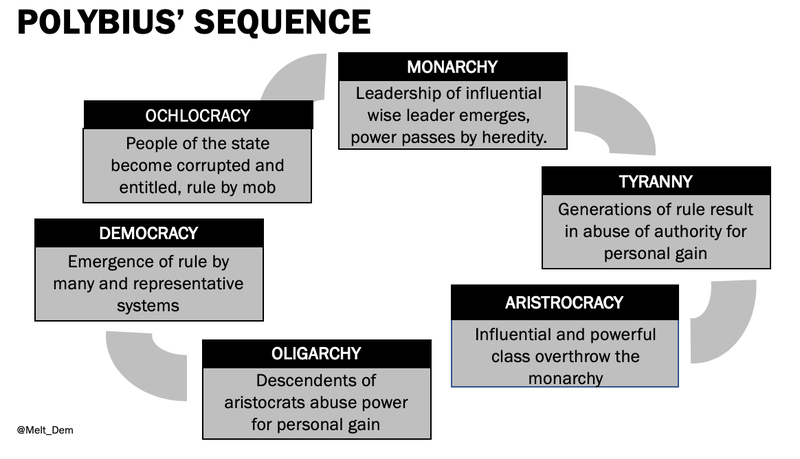 Most forms of governance begin as “benign” in nature — whether it be monarchy, aristocracy, or democracy. Over time, these benign and weak forms of governance are abused and become malignant, devolving into tyranny, oligarchy, and ochlocracy. Eventually, those subject to malignant rule overthrow it in favor of a more benign form of rule, and the cycle begins a new. Arguably, the emergence of governance oriented protocols was a direct response to the perceived tyranny of bitcoin. But as these protocols are implemented and their governance mechanisms activated, we see them, in turn, plagued by their own unique forms of dysfunction. Perhaps the ultimate fate of many of these systems is rule by mob, where we all scream at one another on crypto twitter, until we see a wise ruler emerge (via Medium post, of course) who tames us all and decrees how it shall be going forward. Who knows how the future will unfold. I have some ideas, some of which are shared above, but nothing is certain. Part of the fun here is watching these ideas unfold in real time. 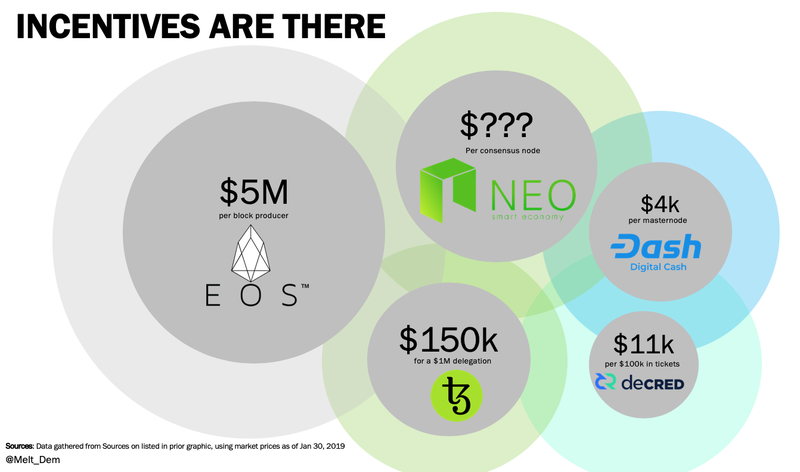 As more and more Proof of Stake networks go live, it will be fascinating to see how these new networks evolve and grow to maneuver around the risks outlined above. I am particularly intrigued by Cosmos, given its attempts to actively remove cartels from the system, and if and how that will prompt cries of “de-platforming” from those who happen to run these cartels. After all, the beauty of blockchain networks is their un-censorable nature, which means intent in design becomes all the more important. If abuse is possible in your design, then is it the fault of the abuser or the designer? Arguably, using the rules to play the game in a manner different than which it was designed for isn’t a crime. In the meantime, I continue to actively track the economics of staking, and to date, have chosen to focus primarily on Tezos to further my learning and my experimentation with proof of stake and on-chain governance. However, over time, this may change, and I look forward to sharing what I learn with the community. Slides: You can see and download the slides from this talk here Speakerdeck, and see other slides I’ve published here (not always up to date, but I try). Feel free to borrow and use as you like, but please attribute when and where appropriate. Notes and Disclosures: *The Battlestar Capital team works out of our NY office, and we engage in a lot of lively debates around the economics and politics of staking, so it could be argued that I’m biased here. *I’m an investor in Messari. Please note that this Blog Post is provided on the basis that the recipient accepts the following conditions relating to the provision of the same (including on behalf of their respective organisation). This Blog Post does not contain or purport to be, financial promotion(s) of any kind. This Blog Post does not contain reference to any of the investment products or services currently offered by members of the CoinShares Group. Digital assets and related technologies can be extremely complicated. The digital sector has spawned concepts and nomenclature much of which is novel and can be difficult for even technically savvy individuals to thoroughly comprehend. The sector also evolves rapidly. With increasing media attention on digital assets and related technologies, many of the concepts associated therewith (and the terms used to encapsulate them) are more likely to be encountered outside of the digital space. Although a term may become relatively well-known and in a relatively short timeframe, there is a danger that misunderstandings and misconceptions can take root relating to precisely what the concept behind the given term is. The purpose of this Blog Post is to provide objective, educational and interesting commentary. This Blog Post is not directed at any particular person or group of persons. Although produced with reasonable care and skill, no representation should be taken as having been given that this Blog Post is an exhaustive analysis of all of the considerations which its subject matter may give rise to. This Blog Post fairly represents the opinions and sentiments of its author at the date of publishing but it should be noted that such opinions and sentiments may be revised from time to time, for example in light of experience and further developments, and the blog post may not necessarily be updated to reflect the same. Nothing within this Blog Post constitutes investment, legal, tax or other advice. This Blog Post should not be used as the basis for any investment decision(s) which a reader thereof may be considering. Any potential investor in digital assets, even if experienced and affluent, is strongly recommended to seek independent financial advice upon the merits of the same in the context of their own unique circumstances. This Blog Post is subject to copyright with all rights reserved.